As per the notice of combined Graduate Level Examination, 2016 published on 13.02.2016 on Staff Selection Commission’s website as well as Employment news/ Rozgar samachar. The number of Questions is 100 which would carry 200 marks. The duration of the examination would be for 75 minutes. 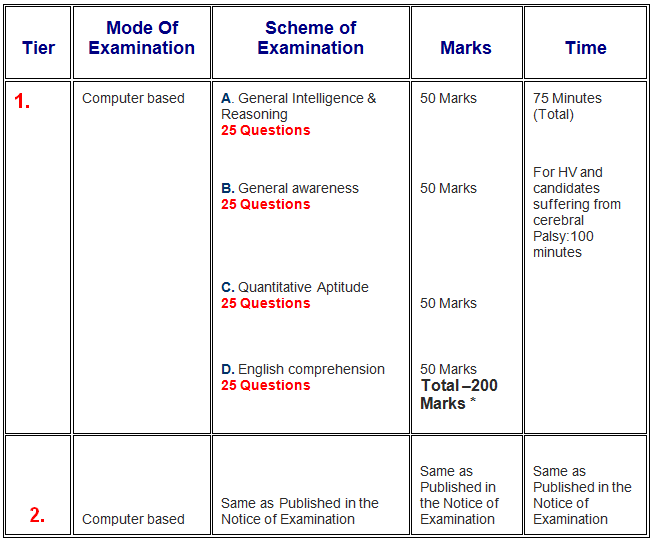 It is computer based examination mode in place of OMR based examination mode. It is scheduled to be held from 27th AUGUST, 2016. Accordingly, the revised scheme of examination is detailed below. There will be negative marking of 0.50 for each wrong answer. The candidates will have the option to choose any one medium. The details are given below under. For VH and candidates suffering from cerebral Palsy:80 Minutes. There will be no sectional cut-off.